When you get a new Mac, it comes with one startup drive (a hard disk or, in a few cases, a solid-state disk) named “Macintosh HD.” This arrangement is perfectly fine for most of us, but it’s not your only option. If the need arises, you can split that disk up. Any internal (IDE or SATA) or external (FireWire, USB, or eSATA) disk can be reorganized into one or more volumes called partitions. Each partition appears on your Desktop as an independent disk, and you can even mix and match formatting methods from one partition to the next on the same disk. You can use Disk Utility (found in /Applications/Utilities) to repartition a drive, although doing so normally requires erasing the entire drive in the process. You can also choose from several third-party utilities, such as Prosoft Engineering’s $99 Drive Genius 2 and Coriolis System’s $45 iPartition that can change a drive’s partitioning without erasing it. If your Mac is capable of running multiple versions of OS X (for example, you have an early Intel-based iMac that can run Tiger, Leopard, or Snow Leopard), you can partition your drive so that you can use more than one. 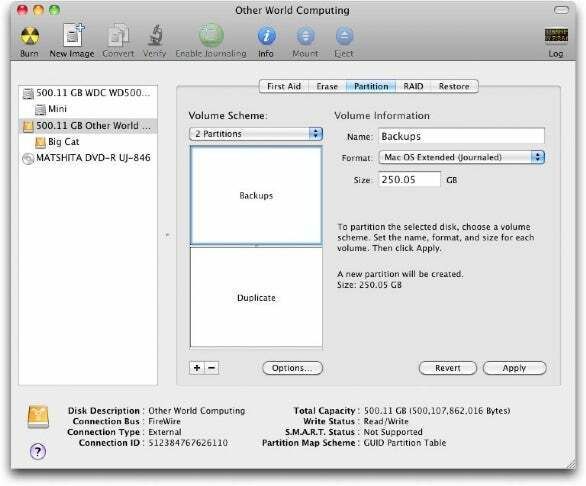 Divide your disk into one partition for each version of OS X, and then install the operating systems separately. When you need to run a different version of the operating system—say, for testing, or to use older software that won’t run under a newer OS—open the Startup Disk pane of System Preferences, select the partition you want, and click on Restart. If you use Boot Camp Assistant (built into OS X 10.5 Leopard and later) to run Windows on your Mac, it creates a special partition just for your Windows installation. Unfortunately, Boot Camp Assistant won’t work if your disk is already partitioned, so if you intend to use Boot Camp, you’ll have to stick to just two partitions (one each for Windows and OS X). If your startup volume develops disk errors, you may need to run a repair program (such as Disk Utility) from another volume in order to fix them. That other volume could be an external hard drive or a bootable DVD. But another option is to keep a small partition on your main disk that includes a bootable copy of OS X and a repair utility or two. When trouble strikes, you can boot up from this volume and fix some problems without having any secondary media at all. If you want to share a single iPhoto library between two or more user accounts on the same Mac, one way to do so, per Apple’s advice, is to move it to a volume where ownership is ignored. That can’t be your main startup volume, but it could be an external disk—or another partition of your internal disk. I recommend maintaining two kinds of backups. The first is bootable duplicates of your entire disk, using a program such as Bombich Software’s Carbon Copy Cloner (donation requested) or Shirt Pocket Software’s $28 SuperDuper!. The second is versioned backups (which store copies of your files as they appeared at many points in time) using Apple’s built-in Time Machine or any of numerous other backup utilities. You don’t need to keep two different hard drives around for your two types of backup. Instead, use partitions. For example, if you have a 1TB internal disk, you could buy a single 2TB external drive, divide it into two 1TB partitions, and then put your bootable duplicate on one while using the other for versioned backups. Disk Utility lets you divide one physical disk into multiple partitions.